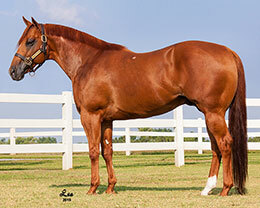 Grade 1 stakes sire Dominyun got two finalists in Saturday's Old South Futurity at Delta Downs. VINTON, LA�APRIL 22 2017�Grade 1 stakes sire DOMINYUN sired two finalists to the Old South Futurity at Delta Downs Saturday night. The 10 fastest qualifiers, from 54 juveniles who competed in six trails, will return to Delta Downs on Saturday, May 13th and vie for the winners' share of $81,430 purse going 330 yards. Winless in three starts, Dezignator finished a neck off fastest qualifier The Cartel Warrior to get the second fastest time of :16.926 seconds. Robert Touchet trains the son of DOMINYUN for owner Guerras Racing Stables. Floriberto Maldonado rode the Bobby D. Cox Texas-bred out of Seraphima by Brimmerton. Emnent, also a gelding by DOMINYUN, posted the fourth fastest time after finishing second by a nose in the final trial. The Bobby D. Cox homebred is trained by Kenneth Roberts, Sr. and was ridden by David Alvarez. Out of the Corona Cartel mare Bodacious Dream, Emnent was fourth in the Grade 3 Harrah's Entertainment Futurity last month at Louisiana Downs. He has earned $19,150. For the complete list of Old South Futurity qualifiers, times, sires, dams, owners, breeders, trainers and jockeys CLICK HERE.